As much as Microsoft doesn’t like it, there are still a ton of on-premise Dynamics 365 customers, and that isn’t changing anytime soon. 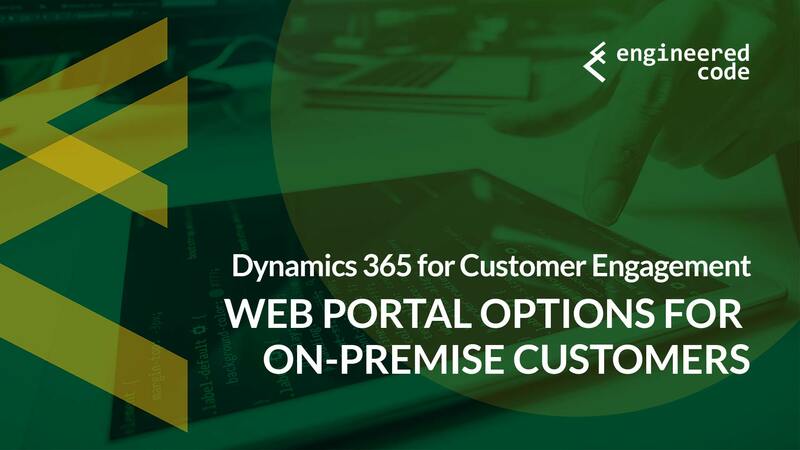 Since the Dynamics 365 Portal offering from Microsoft is only available for Dynamics 365 Online, this isn’t an option for on-premise customers. And, since almost every organization could probably make good use of a portal, what’s an on-premise customer to do? As a way to help customers using the legacy version of Adxstudio Portals v7 transition to the cloud (and perhaps as a way to appease on-premise customers), Microsoft released the source code of Dynamics 365 Portal v8.3 under an open source license, as well as the managed versions of the required D365 solutions. Adoxio, the company that was spun out of Adxstudio (who originally built the Portal technology and was acquired by Microsoft) has even taken this code and created a GitHub project, so that any bug fixes/enhancements could be shared by the community – this project is called xRM Portals Community Edition. Using this, you can create and host your own portal, even with an on-premise Dynamics environment. Sounds great, right? It’s open source so you can customize it as you please, no licensing costs. Unfortunately, there’s a few reasons why I don’t recommend this approach. First of all, while Microsoft did release the source code for the website, as I mentioned the solutions they provided are all managed. There are plugins and custom workflow activities in those solutions that we don’t have the source code for. So while there some parts are open source, other parts there are no easy ways of modifying if there are ever any breaking changes with Dynamics 365. Next, there is no support from Microsoft. I believe Adoxio may offer support, and any partner with Adxstudio experience could help you, but everyone is locked out from the items mentioned above. Don’t get me wrong – we’ve used xRM Portals Community Edition on a number of projects, but only as an option for upgrading from Adxstudio Portals v7, where the customers had a significant investment in custom code. I believe that being on xRM Portals Community Edition is much better than being on Adxstudio Portals v7, because the open-source nature of xRM Portals Community Edition allows you to provide better support with the ability to fix some bugs. But I don’t recommend it for new projects – I believe that it’s a ticking time bomb that will go off at some point – not necessarily in the short term, but very possibly within the expected lifetime of a portal project that was just getting started now. So, I’ll start with the standard statement – I’m not endorsing any of these products, I’m just listing some here for your reference. I’m not getting paid by anyone to put a link here. Please let me know if I’ve missed any you think should be added to this list. This one might be the most popular alternative to the Dynamics 365 Portal from Microsoft. This product is an add-on to Sitefinity, which is an ASP.NET Content Management System (CMS). Sitefinity is a much more powerful CMS than Dynamics 365 Portal is (and will most likely ever be), and the Portal Connector add-on allows you to easily present Dynamics 365 data on your website, with full support for creating and editing records. The folks over at AlexaCRM know portals (they are led by Business Applications MVP George Dubinski, of CRM.Audio and CRM Tip of the Day fame, who also knows a thing or two about the Dynamics 365 Portal product). They also know PHP and WordPress, so they combined this knowledge to create a framework to make it easy to talk to Dynamics in PHP, as well as a WordPress plugin that lets you interact with Dynamics 365 data. I discovered this product at CRMUG Summit in Dublin in the Spring of 2018. I don’t have any personal experience with it, but it does sound interesting. It’s based on Drupal, which is a platform we’ve used before, so I’m hoping at some point to play with it a bit to see what it can do. So, while I’m not recommending any particular product, I think in general using a third-party off-the-shelf solution is something you should strongly consider. If you’re new to portals with Dynamics, find out what the skill set of your resources is – for example if you’ve got someone with experience in WordPress, it’s probably worth looking into AlexaCRM. If your developers know .NET, then maybe consider the Portal Connector. Of course, typically these tools will have some licensing costs associated with them, but I usually find that if these products have the feature set you’re looking for, it’s unlikely you can do it cheaper yourself, and get the same quality. Of course, you can always build it yourself. Remember that the ISVs mentioned above, as well as Adxstudio, have never had special access to Dynamics. All of these tools use the standard CRM SDK to communicate with Dynamics 365. So there is nothing stopping you from using that SDK with your favorite web technology and building out your own portal. I think this is something to consider if you’ve got web development experience. It’s also something worth considering if none of the off-the-shelf solutions give you the features that you need. But be warned – if building web portals is not something you’re familiar with, then the learning curve can be steep. For example, the authentication piece can be tricky, and you want to be sure that anything having to do with security is done properly. Don’t Forget – All of These Options Are for Online Customers Too! It may seem obvious, but keep in mind that all of the above options apply to Dynamics 365 Online as well. The Microsoft offering is not the only option you should be considering when the need for a Portal arises. While I think it’s a great tool, it’s not the correct tool for every job. So the next time you have the requirement for a portal, make sure you’re considering all of your options. Next : Dynamics 365 Portal: How Does the Entity Form or Entity List Get on the Page?